Arabic, which literally flows from right to left, is written in calligraphy that looks more like an abstract painting than words on a page - or on your skin. An Arabic word, phrase, or symbol is a graceful addition to your personal ink. Arabic is a living language that continues to evolve from its ancient roots. Today's swirls and swoops were inspired by Egyptian hieroglyphics that were transformed into the first alphabet by an unknown scribe (in what is now Syria). They traveled throughout the Middle East and the Mediterranean with Phoenician traders before they were eventually picked up by people living in the Arab Peninsula. Arabic has always served the double purposes of both art and communication. This is particularly evident in Arabic tattoo designs. Islam views the use of figurative art (depictions of people or living beings) as verging on idolatry. As a result and over the centuries, the majority of artwork relies on ornamental patterns and vegetation. The exquisite calligraphy still dominates artistic expression, so your choice of an Arabic tattoo represents an acknowledgment of this tradition, beauty, and meaning. Pick your favorite inspirational word and become inspired all over again by its incarnation as Arabic ink on your wrist or arm. The simplicity of Love, Peace, Life, or Wisdom evokes a wealth of poetry and purpose to remind you of what's important. Whether it's a phrase or a fragment from a poem, a line of Arabic writing down your ribcage or across the small of your back conveys the intellectual treasure of a rich culture, with your body as the canvas. Be extremely careful to check and double-check all translations with at least two reputable Arab speakers. Your tattoo will be lovely to look at but if it mistakenly substitutes "bathroom" for "beloved," it will be snicker-worthy to any Arab speaker. The exotic and artistic charms of an Arabic tattoo are favorites with the famous. Angelina Jolie has several words and lines of Arabic on her well-documented skin. The single word on her forearm means "determination" or "strength of will." Singer Selena Gomez had her right mid-back tattooed at a New York studio with the Arabic phrase for "love yourself first." Rock star Rihanna didn't fare so well. The horizontal Arabic phrase on her left rib cage should read: "the freedom in the Messiah" but someone left off the second "the." Fortunately, there is room in the tattoo for a touch-up. 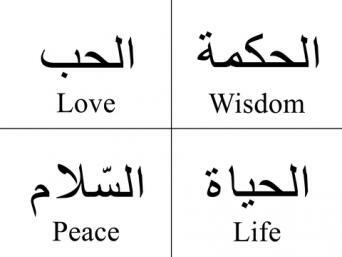 The following websites contain many Arabic proverbs/quotes, some of which could be converted into fantastic, meaningful tattoos. Again, just make sure to check for accuracy when transcribing! ThinkExist.com - Most of these quotes are quite short, making them perfect for tattoos. Quotes.net - There are a few proverbs here, many of which will be familiar to you. World of Quotes.com - Another list with a nice selection of meaningful proverbs. The Hamsa, or Hand of Fatima, is an Islamic symbol for Muhammad's daughter, Fatima Zahra. Hamsas are used as protective marks to shield the bearer from the evil eye and to confer every sort of good fortune - in health, wealth, love, goodness, and a peaceful life. Fatima is considered the embodiment of courage and was a loyal wife and mother. The five fingers in the hand represent both Muhammad's family and the five pillars of Islam: faith, prayer, almsgiving, fasting, and a traditional pilgrimage to Mecca. 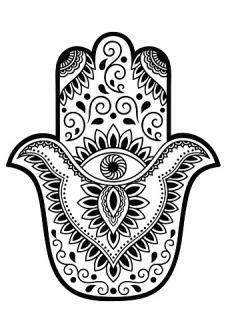 A Hamsa is stunning on a hand but is also a strong shape for a shoulder, bicep, or upper back. The red dye henna is a traditional body adornment in Indian and Middle-Eastern cultures. It may be used for lasting, non-permanent Arabic tattoos. Henna is a great way to try out a tattoo to be sure you can live with it before committing to ink. It's also used as a cosmetic to beautify a bride, as well as an embellishment for an important celebratory event. Most typically, hands are tattooed with henna. It covers the palms but may also cover the backs of the hands and continue scrolling up the wrist and arms. 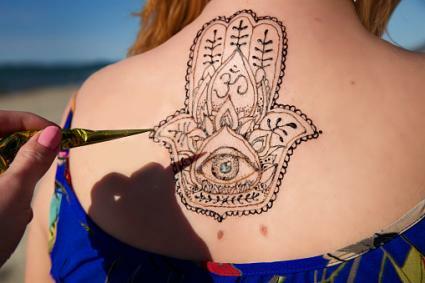 Experiment first with an Arabic tattoo in henna wherever you want to place permanent ink - or just use it as temporary fabulousness, such as a "necklace" drawn directly on the neck and chest, or a word or symbol on an upper arm or calf. Conservative Muslim cultures in the Middle East do not sanction tattoos, regarding them as evidence of ancient pagan practices or as desecration of the body. Henna is an acceptable alternative to body ink in those Muslim communities. Avoid inadvertently offending those of the Islamic faith, and exhibit some cultural awareness and sensitivity, by skipping verses from the Quran or the words of the Prophet. Your Arabic name - or your name transcribed into Arabic - would be an appropriate declaration of your appreciation for the symbolism and sublime artistry of Arabic calligraphy.